The tradition of the West is embodied in the Great Conversation that began in the dawn of history and that continues to the present day. Whatever the merits of other civilizations in other respects, no civilization is like that of the West in this respect. No other civilization can claim that its defining characteristic is a dialogue of this sort. No dialogue in any other civilization can compare with that of the West in the number of great works of the mind that have contributed to this dialogue. The goal toward which Western society moves is the Civilization of the Dialogue. The spirit of Western civilization is the spirit of inquiry. Its dominant element is the Logos. Nothing is to remain undiscussed. Everybody is to speak his mind. No proposition is to be left unexamined. The exchange of ideas is held to be the path to the realization of the potentialities of the race. At a time when the West is most often represented by its friends as the source of that technology for which the whole world yearns and by its enemies as the fountainhead of selfishness and greed, it is worth remarking that, though both elements can be found in the great conversation, the Western ideal is not one or the other strand in the conversation, but the conversation itself. It would be and exaggeration to say that Western civilization means these books. The exaggeration would lie in the omission of the plastic arts and music, which have quite as important a part in Western civilization as the great productions included in this set. 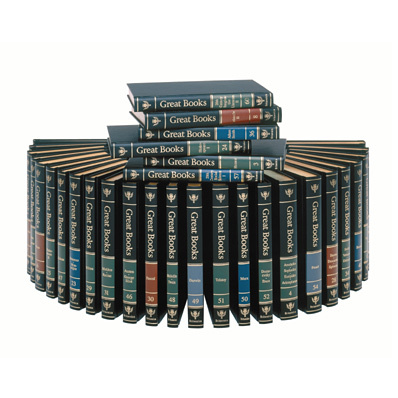 But to the extent to which books can present the idea of a civilization, the idea of Western civilization is here presented [in the Great Books]. These books are the means of understanding our society and ourselves. They contain the great ideas that dominate us without our knowing it. There is no comparable repository of our tradition. To put an end to the spirit of inquiry that has characterized the West it is not necessary to burn the books. All we have to do is to leave them unread for a few generations. On the other hand, the revival of interest in these books from time to time throughout history has provided the West with new drive and creativeness. 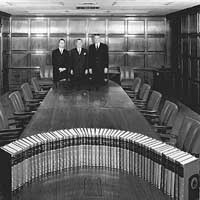 Great Books have salvaged, preserved, and transmitted the tradition on many occasions similar to our own. Until very recently these books have been central in education in the West. They were the principal instrument of liberal education, the education that men acquired as an end in itself, for no other purpose than that it would help them to be men, to lead human lives, and better lives than they would otherwise be able to lead. The aim of liberal education is human excellence, both private and public (for man is a political animal). Its object is the excellence of man as man and man as citizen. It regards man as an end, not as a means; and it regards the ends of life, and not the means to it. For this reason it is the education of free men. Other types of education or training treat men as means to some other end, or are at best concerned with the means of life, with earning a living, and not with its ends. The substance of liberal education appears to consist in the recognition of basic problems, in knowledge of distinctions and interrelations in subject matter, and in the comprehension of ideas. Liberal education seeks to clarify the basic problems and to understand the way in which one problem bears upon another. It strives for a grasp of the methods by which solutions can be reached and the formulation of standards for testing solutions proposed. The liberally educated man understands, for example, the relation between the problem of the immortality of the soul and the problem of the best form of government; he understands that the one problem cannot be solved by the same method as the other, and that the test that he will have to bring to bear upon solutions proposed differs from one problem to the other. The liberally educated man understands, by understanding the distinctions and interrelations of the basic fields of subject matter, the differences and connections between poetry and history, science and philosophy, theoretical and practical science; he understands that the same methods cannot be applied in all these fields; he knows the methods appropriate to each. The liberally educated man comprehends the ideas that are relevant to the basic problems and that operate in the basic fields of subject matter. He knows what is meant by soul. State, God, beauty, and by the other terms that are basic to the insights that these ideas, singly or in combination, provide concerning human experience. The liberally educated man has a mind that can operate well in all fields. He may be a specialist in one field. But he can understand anything important that is said in any field and can see and use the light that it shed upon his own. The liberally educated man is at home in the world of ideas and in the world or practical affairs, too, because he understands the relation of the two. He may not be at home in the world of practical affairs in the sense of liking the life he finds about him; but he will be at home in that world in the sense that he understands it. He may even derive from his liberal education some conception of the difference between a bad world and a good one and some notion of the ways in which one might be turned onto the other. 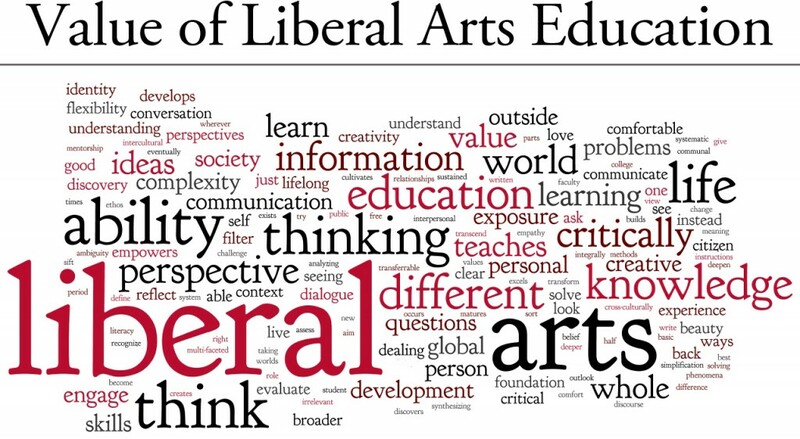 The method of liberal education is the liberal arts, and the result of liberal education is discipline in those arts. The liberal artist learns to read, write, speak, listen, understand, and think. He learns to reckon, measure, and manipulate matter, quantity, and motion in order to predict, produce, and exchange. As we live in the tradition, whether we know it or not, so we are all liberal artists, whether we know it or not. We all practice the liberal arts, well or badly, all the time every day. As we should understand the tradition as well as we can in order to understand ourselves, so we should be as good liberal artists as we can in order to become as fully human as we can. The liberal arts are not merely indispensable; they are unavoidable, Nobody can decide for himself whether he is going to be a human being. The only question open to him is whether he will be an ignorant, undeveloped one or one who has sought to reach the highest point he is capable of attaining. The question, in short, is whether he will be a poor liberal artist or a good one. The tradition of the West in education is the tradition of the liberal arts. Until very recently nobody took seriously the suggestion that there could be any other ideal. The educational ideas of John Locke, for example, which were directed to the preparation of the pupil to fit conveniently into the social and economic environment in which he found himself, made no impression on Locke’s contemporaries. And so it will be found that other voices raised in criticism of liberal education fell upon deaf ears until about a half-century ago. This Western devotion to the liberal arts and liberal education must have been largely responsible for the emergence of democracy as an ideal. The democratic ideal is equal opportunity for full human development, and, since the liberal arts are the basic means of such development, devotion to democracy naturally results from devotion to them. On the other hand, if acquisition of the liberal arts is an intrinsic part of human dignity, then the democratic ideal demands that we should strive to see to it that all have the opportunity to attain to the fullest measure of the liberal arts that is possible to each. The present crisis in the world has been precipitated by the vision of the range of practical and productive art offered by the West. All over the world men are on the move, expressing their determination to share in the technology in which the West has excelled. This movement is one of the most spectacular in history, and everybody is agreed upon one thing about it: we do not know how to deal with it. It would be tragic if in our preoccupation with the crisis we failed to hold up as a thing of value for all the world, even as that which might show us a way in which to deal with the crisis, our vision of the best that the West has to offer. That vision is the range of the liberal arts and liberal education. Our determination about the distribution of the fullest measure of these arts and this education will measure our loyalty to the best in our own past and our total service to the future of the world. 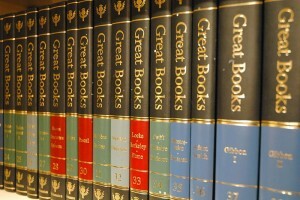 The great books were written by the greatest liberal artists. They exhibit the range of the liberal arts. The authors were also the greatest teachers. They taught one another. They taught all previous generations, up to a few years ago. The question is whether they can teach us.